* Sunny streak into Wednesday, southerly winds increase by midweek, approaching 30 mph. * More than half of 2010's tornadoes around the USA have touched down in the last week. * More on the Mississippi super-outbreak, possible EF-5 tornado? * Strongest tornado ever observed in the USA near Oklahoma City. Remembering May 3, 1999. * Slight chance of strong/severe storms across Minnesota Thursday PM hours. * Less man-made pollution actually increasing the rate of warming worldwide? Wednesday: Sunny, windier, warmer. High: 68 (some thermometers may top 70). 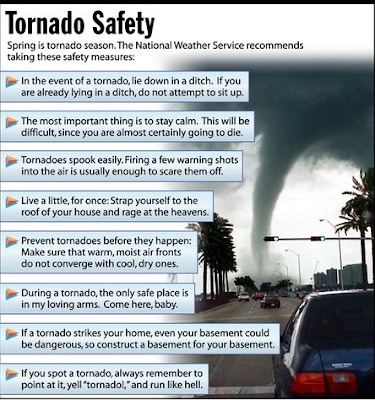 Attempted Tornado Humor. I know - I know, nothing funny about a tornado. I don't mean to be politically incorrect, but someone e-mailed me this yesterday, and in the spirit of full disclosure I'm passing it on. No, it's not funny that people died in Mississippi, the weekend outbreak was a tragedy. If you're easily offended please skip over this entry, ok? "During a tornado the only safe place is in my loving arms. Come here, baby," made me laugh. I needed a chuckle yesterday... The complete article (in "The Onion", of course) can be found here. Weather is a non-issue again, meteorological auto-pilot, no atmospheric issues, worries or nagging concerns. It's still Palm Springs (with lakes instead of desert bluffs). Come to think of it I believe Minnesota has more golf courses than Palm Springs. More corn fields, too. Those fields, lawns and gardens picked up a nice surge of rain over the weekend, not the prolonged soaking we really need, but a step in the right direction. Monday Almanac. Highs around the region were fairly uniform: 63 in St. Cloud and the Twin Cities to 66 in Eau Claire, WI. Dry, Canadian air surging south of the border will promise a sun-scrubbed sky today (fewer mid/high-level clouds than yesterday) with a light breeze and highs in the low to mid 60s - after a potentially frosty start north/east of St. Cloud. Any light jackets or sweatshirts at the bus stop this morning will be long-forgotten in your child's school locker by 5 pm - they may wind up with a nice collection of jackets by late-week, each afternoon lukewarm enough for shirtsleeves (and sunglasses). Highs approach 70 by Wednesday as winds gust from the south, low 70s are possible Thursday if the rain/storms hold off until later in the day. It's still too early to speculate about the potential for severe weather Thursday PM (it has been remarkably quiet in the severe weather department so far this spring), but we may have some of the ingredients necessary to whip up strong, to isolated severe storms by the dinner hour. We're long overdue. Low-level moisture will be limited, dew points near 50 (the dew point usually has to rise above 60 for large and widespread severe storms), wind shear will be light to moderate (the degree of twisting/turning winds with altitude) and instability marginal as well. I'm not too concerned, at least not yet, but we'll have to watch the skies Thursday for possible watches and warnings. Moist, unstable air on the backside of Thursday night's cool frontal passage will keep a few showers in the forecast for Friday, especially early morning, a few more instability, pop-up showers (or T-showers) late Friday. The weekend forecast is still something of an enigma, wrapped in a riddle. A drying northwesterly breeze will kick in Saturday, revealing intervals of sun, but a nagging puddle of cold air aloft (one of those pesky "upper air disturbances" meteorologists revel in) may keep our sky just unstable enough for a late PM shower or T-storm Saturday, again Sunday. That said: MOST of the weekend looks dry, highs well up into the 60s, the weather cooperating for lawn mowing festivals, ball games, bike rides and wrestling with your favorite pieces of dock. 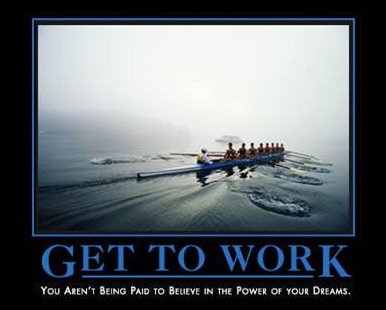 Can't wait for that. Then again, I'm not complaining one bit about the specter of a nearly 6-month boating season...in Minnesota? Lately I've been experiencing strange flashbacks, odd, fleeting "where the heck-am-I-living" moments. Too mild, to nice, too fast - makes me nervous about what's coming next. I think I said something similar 2 months ago, and we've been lucking out ever since. 126 tornadoes from Colorado to North Carolina since last Tuesday; we're up to 229 twisters nationwide for 2010, still roughly 38% of where we should be as of April 26. It's been a relatively quiet year for tornadoes, but in just the last week Mother Nature slammed the storm machine into high gear - we appear to be catching up for lost time. For another look at the incredible tornado that roared across Mississippi check out storm chaser, Jeff Pietrowski's personal footage here. Evidence of an EF-5? 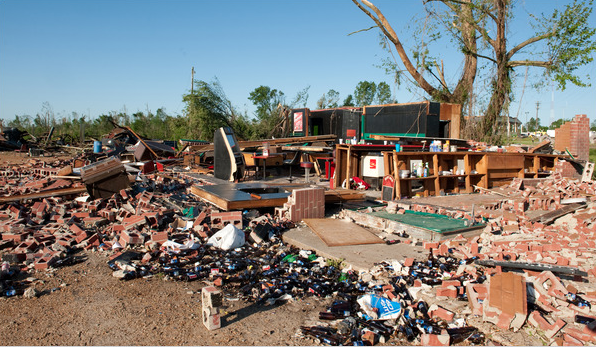 This is all that's left of the neighborhood bar in Yazoo City, Mississippi, after Saturday evening's mile-wide tornado swept through town. Some homes were scoured all the way down to foundation, which is usually a strong clue that the tornado was especially violent, possible an EF-4 or EF-5. Fewer than 2% of all tornadoes in a given year are violent, long-lasting EF-4's or EF-5's. May 3, 1999. 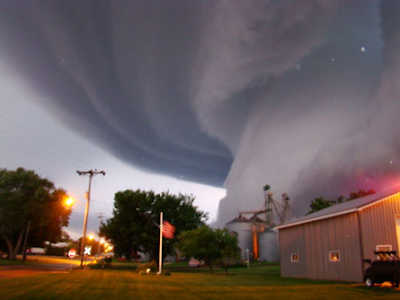 The most violent tornado ever observed in the USA formed southwest of Oklahoma City, 1/2 to 1 mile wide at times. Tracked by a television station's helicopter with blow-by-blow descriptions and warnings from TV meteorologist Gary England, the tornado was well-covered and warned. "If you don't take shelter in a basement you may not survive this tornado," England said, pleading with viewers to take cover below grade, below ground. The sad truth: fewer than 10% of homes in Oklahoma City, in the heart of Tornado Alley, have basements. The reason? Bedrock, solid rock below the topsoil makes it prohibitively expensive for many Oklahomans to excavate for a basement. Wall Cloud. If you ever observe a lowering, rotating cloud (especially at the tail-end, southwest quadrant of a severe thunderstorm) be ready to make a mad dash to the cellar. This was the view on the backside of the tornadic super-cell that spawned an EF-4, possibly an EF-5 twister. The same parent thunderhead spawned as many as 10 separate touchdowns as it swept across Mississippi, with a forward speed approaching 60 mph (!) It was the worst possible scenario: 1/2 to 1 mile wide tornado, moving much too fast to have a safe margin of error to seek shelter. The only silver lining: the mega-tornado struck before dark. The risk goes up tenfold after sunset, when the only way to confirm a tornado on the ground is by lightning flashes. The mega-tornado that raged across Mississippi late Saturday may have been a rare EF-5 storm. Researchers are still on the scene, examining data (specifically how far large, heavy objects were carried in the air by the maxi-tornado). EF-5 winds exceed 200 mph, in rare instances possibly approaching 300 mph, strong enough to scrape even well-constructed brick/stone homes all the way down to the foundation. Keep in mind this is the new "enhanced" Fujita scale, which is (allegedly) more accurate that the old Fujita scale which went from F0 to F5. There has never been an F-6 tornado, although it is theoretically possible. 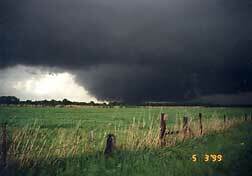 The large, violent tornado that hit Moore, Oklahoma on May 3, 1999 came close. A portable DOW (Doppler on Wheels) just a few miles from the storm measured winds of 316 mph a couple hundred feet above the ground. At the time the threshhold for an F-6 tornado was 318 mph. Incredible. Even though there was 30-45 minutes warning 46 people died, over 400 Oklahomans were injured, some seriously, 8,000 homes were damaged or destroyed, the damage toll approached $1.5 billion. Will there be an EF-6 tornado in our lifetime, somewhere in the USA? Probably. Monstrous Vacuum Cleaner. This was the aftermath of the F-5 tornado that hit Moore, a large southern suburb of Oklahoma City. The tornado steam-rolled across heavily populated neighborhoods and subdivisions - little was left standing. More on the May 3, 1999 tornado can be found here. Tornado Target. A friend of mine, Andrew Revering, has created a software program that pinpoints the location of tornadoes, 4-6 hours in advance. It's still in beta, but if you're a weather enthusiast or storm chaser/spotter you may want to check out what he's doing. I'm intrigued - the program worked VERY well with Sunday's tornado outbreak in the Carolinas. This could be a major breakthrough in tornado prediction - some amazing stuff being cooked up here in Minnesota! 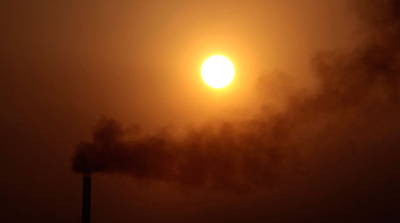 Cleaner Air = Accelerating Warming? It's an intriguing theory: as governments worldwide crack down on heavy industry, cleaning the air of sulfate aerosols and particulate pollution, the air becomes cleaner, fewer pollutants. By some measures the Clean Air Act has worked, the air is 30-50% cleaner than it was in the 1980s, at least across the USA. But cleaning up our act may have some unintended side effects. the cloud of pollutants circling the globe has had a net cooling effect, brightening and expanding cloud cover, conceivably slowing the rate of warming. Cleaner air could very well result in more direct/intense sunlight reaching the ground and the lowest few miles of the atmosphere floating overhead, accelerating the rate of warming worldwide. The L.A. Times has an article on the theory here. This may account for a portion of the "missing heat" that has climatologists stumped. 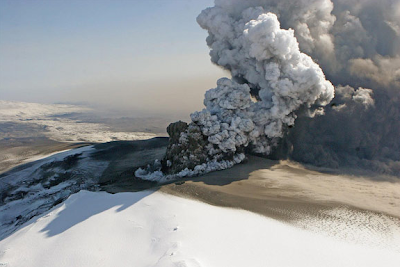 As much as 50% of the warming predicted by 2010 has yet to show up in the observed data - volcanic ash, and man-made pollution may have a very real benefit. So that's the paradox: clean up the air by putting scrubbers on smokestacks and cutting down on the pollutants coming out of cars and trucks - and you may invariably make the warming problem more acute. Something to keep an eye on. Volcano Nightmare. Which 6 volcanoes around the world could trigger the most disruption (to weather, climate, the global economy?) The Week has a rundown of the volcanoes that could - at least in theory - "shut down the world" right here.